Motu-nui Romneys headquarters is at the historic Wairarapa coastal station, ICA, and is run by Jason Le Grove and his team. 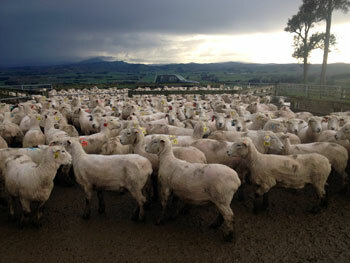 Motu-nui Romney ewes queuing for baleage and alka barley fed out during the 2014/15 drought. 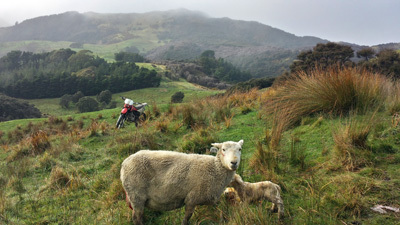 I am often asked what makes us different from other ram breeders, and why should we buy our rams from Motu-nui? • One of the country’s largest recorded Romney flocks farmed on a single farm. • All stock run under commercial conditions, mob- stocked on second class hill country, summer dry and winter wet conditions. The best way to test for constitution. • 7 years of data collection and culling for efficiency; now selecting rams with good parental background based around this trait. • All rams DNA tested for foot rot resistance and parasite resistance. • 20 years involved in Wairarapa Romney Improvement Group sire evaluation testing progeny for saleable meat value. Jason feeding out baleage to ewes during drought of 2014/15 summer. Tagging lambs at birth; chance to assess maternal traits of all ewes. • Large numbers give us a large selection to cull heavily on feet, constitution, dags – the basics that farmers want to improve in their flocks. 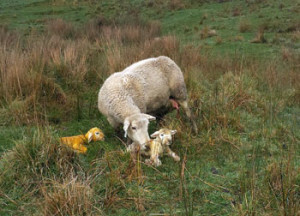 • We lamb hoggets and have done so for the past 25 years. 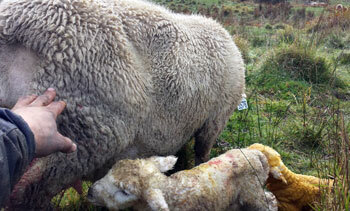 Lambs are tagged at birth – chance to assess maternal abilities. .• Mothering ability is important so we do a lot of culling at lambing time to only bring forward the best mothers to breed from. The class of country that our genetics are going to can’t afford ewes that aren’t easy care. • Full EID in all animals, with significant investment in developing software to make the most of our data collection. New updates are happening all the time. • We sell local, with a large client base in the Wairarapa, and a satellite flock in the South Island. There is constant exchange of Romney genetics between the North Island and South Island flocks. • Proven testing ground. 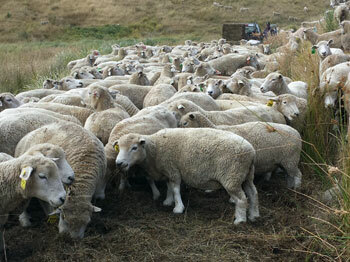 Experience has shown that if stock perform well in the Wairarapa climate they will shift well nationwide. 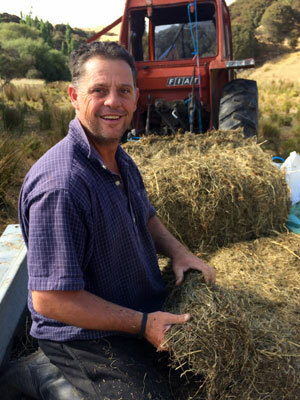 • We work with the stock ourselves and Jason is personally involved in day-to-day management. Call Jason any time on 06 372 3841 or 027 326 7734. 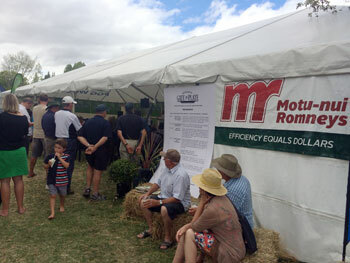 Motu-nui Rams sponsored the Wairarapa A & P Show’s ‘Gate-to-Plate’ 2015 – a great local event celebrating excellence in lamb production. 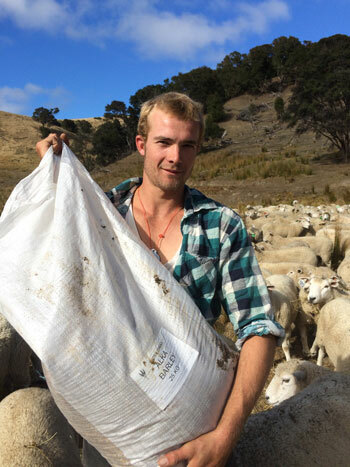 Sam Clark – Stock Manager at ICA Station, April 2015, with a bag of Alka barley. 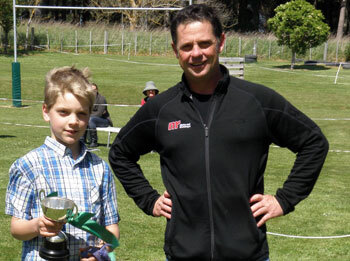 Jason with Gus Neal, the Motu-nui Grand Champion at the Whareama School Pets Day 2012.